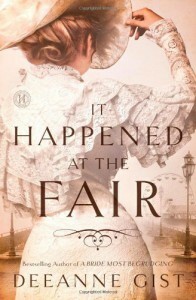 It Happened at the Fair is the second Deeanne Gist book that I have read, and although I very much enjoyed them both and there is familiarization in the writing style, they are quite different from one another.There was much to love about It Happened at the Fair. The time, setting and characters are enough to satisfy my historical romance craving, but it is the historical background, along with the photos of The World’s Fair that really brought the story to life. The author really did her homework on this one, and although there were times where the facts overtook the story, it was still a very pleasant read with a beautiful plot.Note: Although appropriately classified under Christian fiction, there is no mention of it in the story, so do not shy away from this one if you are not normally a fan of Christian fiction.